Fans of iconic New York Times photographer Bill Cunningham's weekly On the Street slideshows may have noticed a familiar Bryant Park winter attraction in last weekend's photo line-up. It's not uncommon to see Mr. Cunningham roaming the park with his camera during the warm weather months, seeking out New York City's fashion trendsetters amongst our busy lunch crowds. But last week it was our frosty fountain that caught his eye. 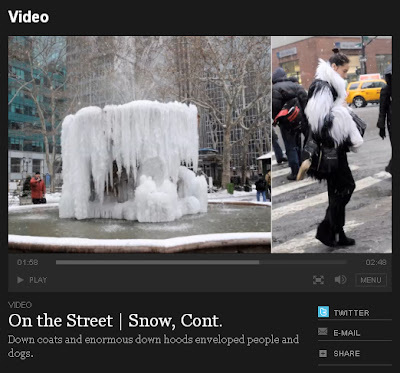 Watch the slideshow here and keep your eyes peeled for multiple shots of a snow-covered Bryant Park (the fountain's cameo begins at the 1:30 mark). Make sure your computer's sound is on, because you don't want to miss the humorous commentary that Bill records to complement his excellent photographs.